Seton Software Development replaced their Clipper Summer 87 application with a VB.NET application. Since the Clipper system was undocumented, redesign of the application had to be completed from scratch. Seton Software Development needed a faster, more efficient method to build reports and communicate the results to customers other than fax or mail. As a result, Seton Software Developments objective was to provide an innovative solution that built reports and had the ability to send automated emails of the results. In order to obtain this result, they utilized ComponentOne VSVIEW 8 Classic Edition and ComponentOne Preview for .NET due to the ease of distribution over other commercial report writing tools, and the flexibility of the product to design any report in any way required. Since this was one of the first .NET applications built by Seton Software Development, creation of the standard framework was the biggest challenge. They were able to leverage standard code produced for previous .NET applications and implement it fully into this application. The application was developed in ten months using a standard framework that Seton Software Development uses for all .NET applications. ComponentOne’s Preview for .NET is part of that framework in that they have a report class wrapper that handles the creation of data-driven criteria screens and a display screen. The programmatic nature of ComponentOne Preview for .NET was a factor in allowing the creation of templates for report development. 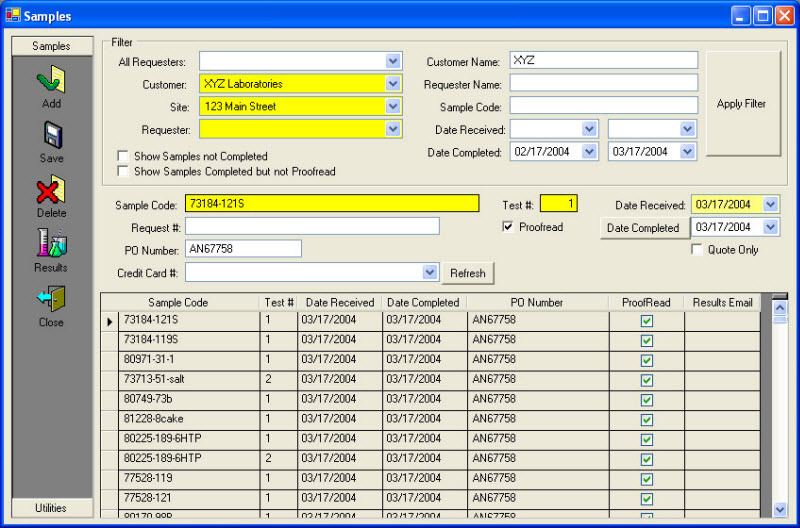 Once the templates were created for columnar, label, and cross tab reports, the rest was easy to implement. Merely create a stored procedure that will retrieve the data, plug into an existing code template, change the names of the fields, and then complete the report. As a result, report builds are now faster by means of VSVIEW 8 Classic Edition and Preview for .NET with no major contortions necessary for non-standard reports. The chemists perform the necessary tests on samples shipped twice daily to the laboratory and the results are immediately emailed back to the user once they are entered into the system and proofread. In this business, speed of reporting results is just as important as accuracy. Specifically, Preview for .NET allowed us to avoid runtime issues and export the client result data as a PDF file, which is then automatically emailed to the customer once the data entered has been proofread. 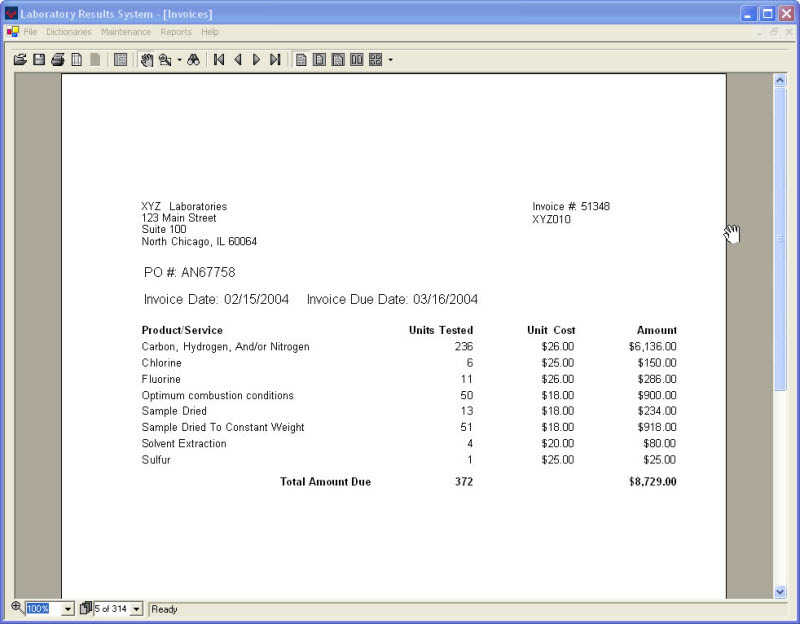 In addition, the application performs monthly invoicing and sales analysis. This solution resulted in a simpler easy-to-use interface, a far more pleasing user experience than a DOS application, and superior searching functionality reducing the time it takes to find and enter sample information. It enables users to enter approximately sixty thousand samples per year, improving user experience by reducing data entry time by ten seconds per sample compared to the old system. The application has also saved $25,000 in time, postage, and maintenance, and timesavings of 20 business days per year in data entry alone. As users of VSVIEW 8 Classic Edition for many years, a product we swear by, it was only natural that we go with the .NET version of the same product. Using Preview for .NET has enabled us to avoid implementing a more expensive and less manageable solution. We are able to build reports faster with VSVIEW 8 Classic Edition and Preview for .NET, and have yet to find any limitations in either product.